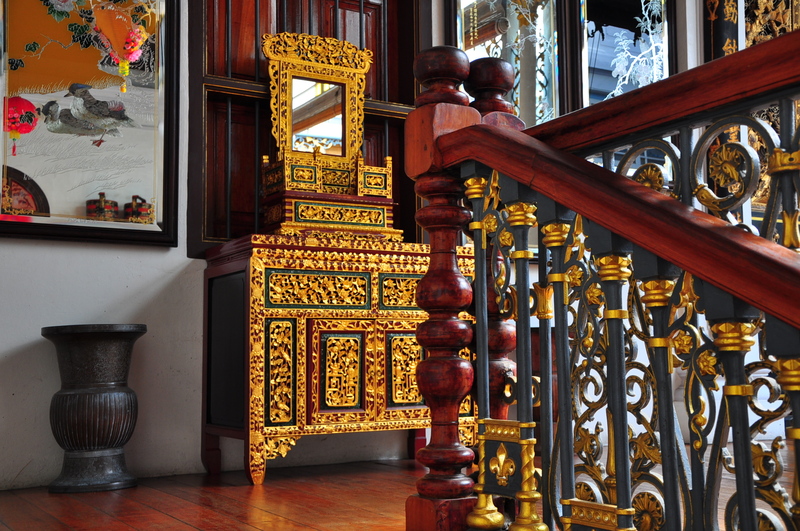 Tycoons and their trappings hold an eternal fascination, and the Pinang Peranakan Mansion not only delivers a fix of sumptuousness, but also a glimpse into the life of privileged Babas and Nyonyas. Built in 1894 by Chung Keng Kwee, the house features a stunning staircase and grand reception areas. Thought to have been occupied by the invading japanese during the Second World War, it was left empty and neglected in 1945 until property developer and antiques collector Peter Soon acquired the house in 2000. Ploughing $2,000,000 into it, he spent four years restoring the building to its former splendour and opened it as a museum, venue and home for his valuable collection of artifacts and furniture in 2004. It attracts a steady stream of tourists and visitors each day, many of whom marvel at the decadent interiors and lavish remnants of a way of life that is gone forever. 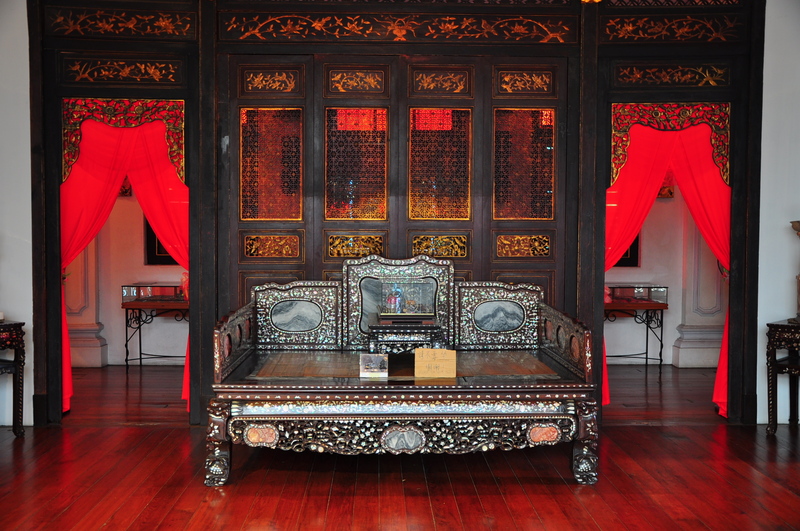 The eclectic design and architecture of the mansion incorporates Chinese carved panels, with English floor tiles and Scottish ironwork and represents a significant element of Penang’s built heritage. 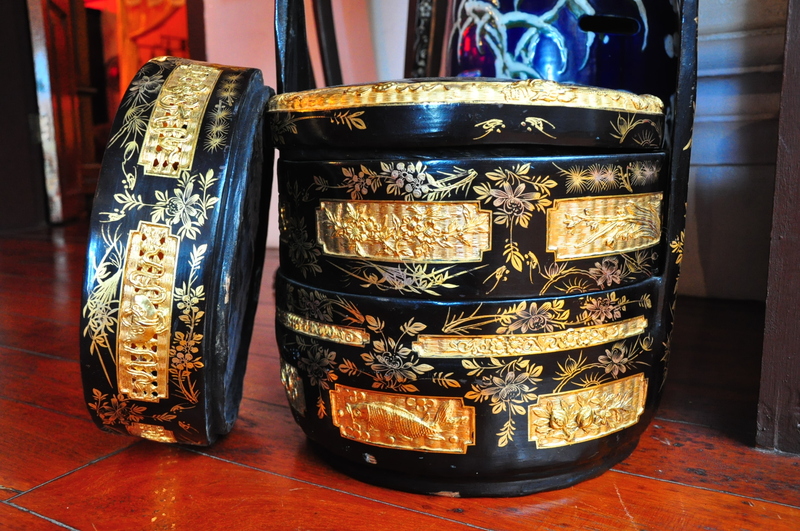 Peranakan is from a Malay word meaning decendents from the union between a local and a foreigner, and Chinese and Malay cultures blended to form a unique lifestyle that included its own speech, customs and cuisine. Also known as the Babas (men) and Nyonyas (women), the Peranakans were concentrated in the Straits Settlements of Penang, Malacca and Singapore, and were also called the Straits Chinese. 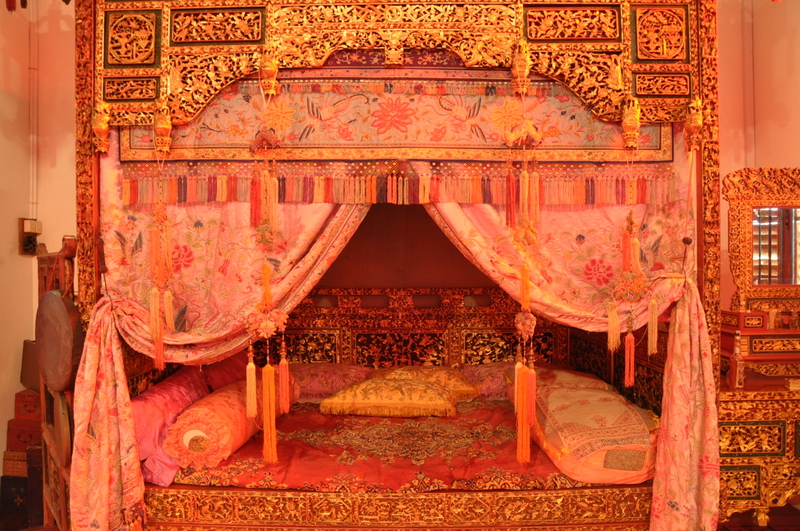 The first recorded Sino-Malay wedding was in 1458 when a Chinese princess married a Malaccan sultan. 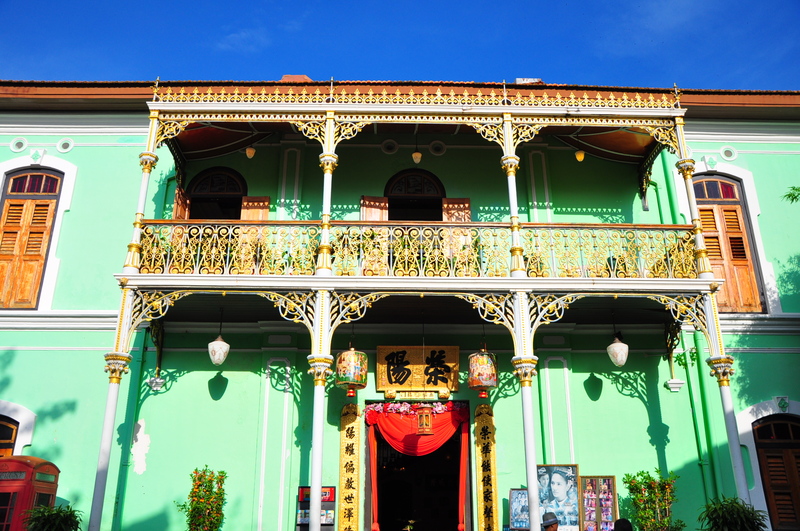 When the British took over Malacca in 1824, Peranakan culture was thriving. After the British established Singapore in 1819, the Peranakans had headed south. In 1786 Penang became an outpost of the East India Company, passing from the sultanate of Kedah to the British. 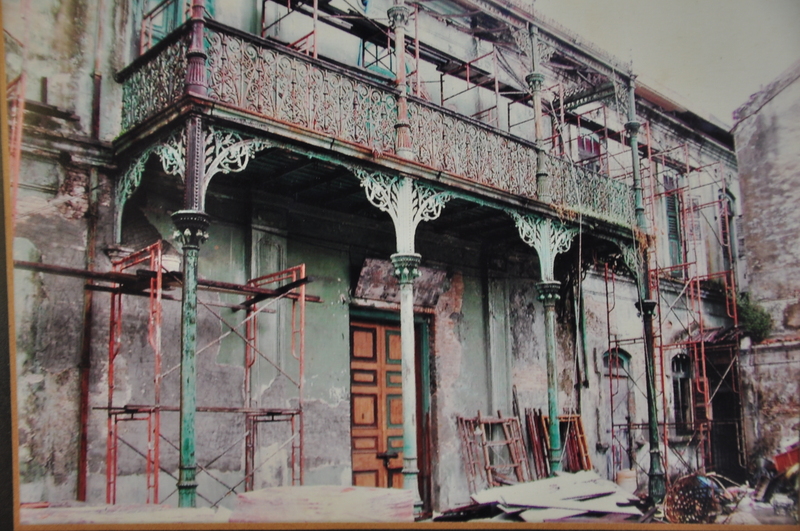 In 1867 Penang, Malacca and Singapore became Crown Colonies and Peranakans began to adopt British customs. 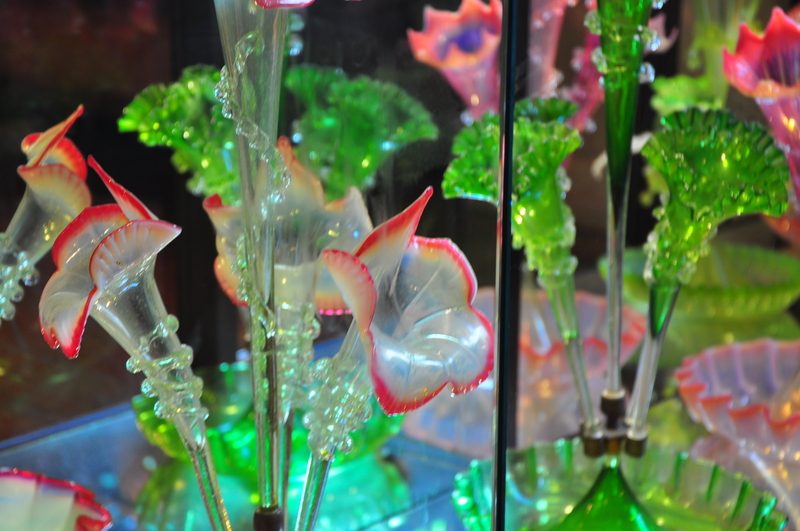 Anglophile Peranakans purchased expensive European collectibles, such as the epergnes (large table centerpieces consisting of a frame with extended arms or branches supporting holders, as for flowers, fruit, or sweetmeats), which can be seen in the mansion and left. Fashionable households also showed off their chandeliers and Venetian glass, and Babas often wore evening suits for their wedding photos although Nyonyas wore traditional robes, headdresses and jewellery. 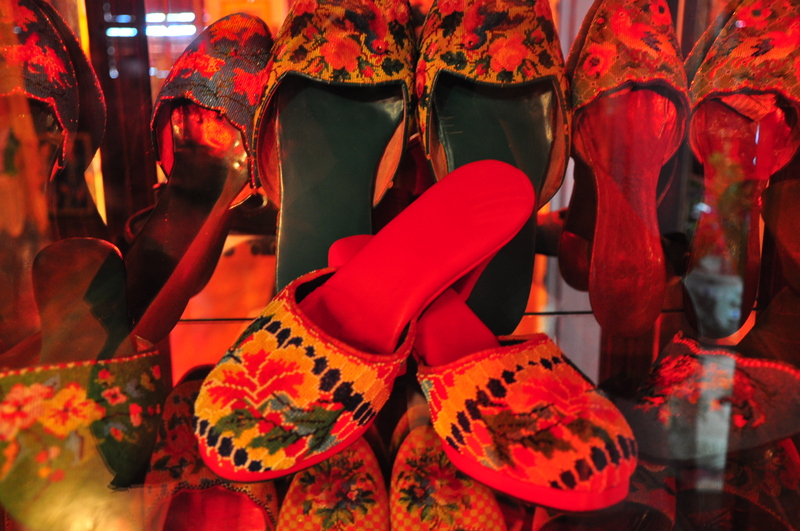 Fashionable Nyonyas usually had a large collection of handcrafted shoes with embroidered uppers, and a number are on display in one of the bedrooms, along with a selection of kebayas, or traditional blouses in sheer, patterned material. Intricately carved screens feature auspicious animals while furniture, often rosewood or blackwood from the Qing period (1694-1911), is frequently inlaid with mother of pearl. There’s too much to take in on one visit, and tours are available with guides who can explain the history of the house and more about its contents.